According to consummate reporter Sara Carter, rogue FBI agent Peter Strzok, whose involvement in both the Hillary Clinton email case and the probe into the Trump campaign’s contacts with Russian government officials, could be facing “serious” charges relating to his wrongdoing. 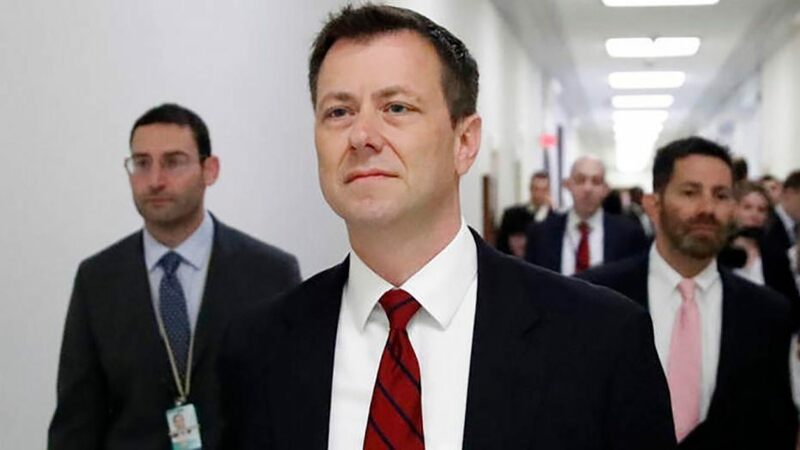 But in addition to being kicked off the Mueller probe and ultimately relieved of his FBI duties altogether, Strzok could be looking at time in the slammer. Carter reports that her sources say that Inspector General Michael Horowitz is still conducting his long investigation of the FBI’s handling of these twin 2016 cases. And from what they’ve seen, his conclusions could spell trouble for any number of FBI and DOJ officials involved in the investigations. This official told Carter that “obstruction” charges could be on the table for Strzok. This week, Attorney General William Barr stirred up a hornet’s nest when he testified that he was confident that the FBI spied on the Trump campaign, vowing to look into it. Democrats immediately circled the wagons and expressed all manner of hysterical alarm, which should give you an idea of just how they frightened they are. They know the jig is up. Russian collusion is over. Obstruction of justice is finished. That’s bad enough. But now we have an attorney general who is actually going to start watching the watchmen? Oh, oh no. That’s no good. This house of cards has been built to the lower stratosphere. When it comes crashing down, expect there to be much wailing and gnashing of teeth.